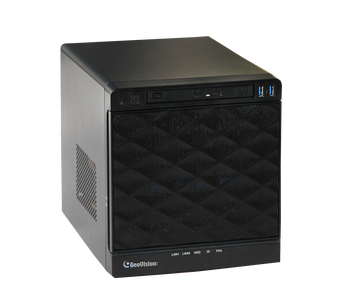 The GV-Cube Network Video Recorder (NVR) Hot-Swap 4-Bay System features the Intel Core i3 / i5 / i7 processor based on Haswell 4th Generation architecture, latest upgraded NVR system and 64-but Microsoft Windows 7. GV-Cube NVR HOTSWAP 4-Bay System supports up to 32 IP Camera channels. With additional licence, connection with up to 32 channels of third-party IP devices is supported. You can also display your video surveillance in HD by using the built-in HDMI port on the system. Screen Rotate Control 1 ∼ 10 sec. Recording Schedule 96 groups per day by 15 min. * For backup function, you need to connect an external USB DVD/CD burner.